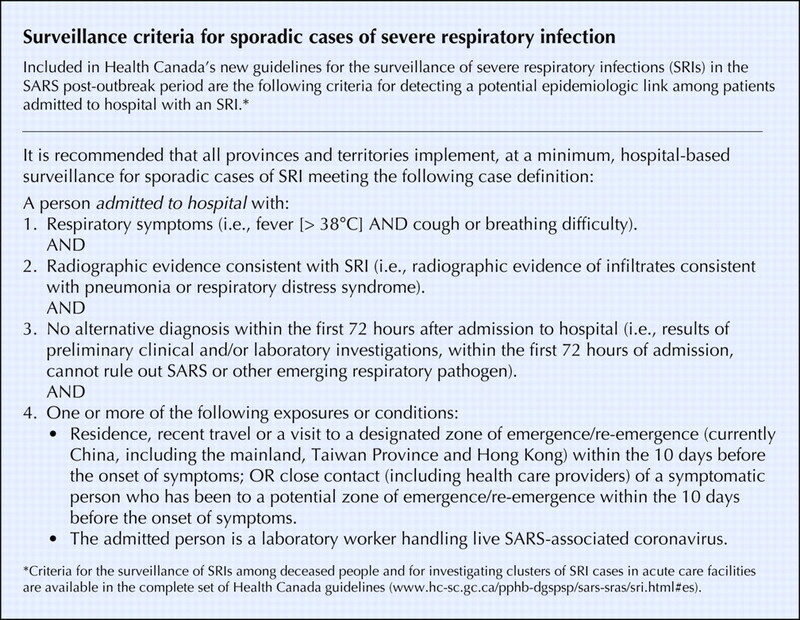 Health Canada's new guidelines for handling severe respiratory infections (SRIs) in the SARS post-outbreak period are being heralded as “striking the right balance.” A critic of how SARS was handled, Dr. Richard Schabas, chief of staff at York Central Hospital, says Health Canada is finally getting it right. The new guidelines (www.hc-sc.gc.ca/pphb-dgspsp/sars-sras/sri.html) offer detailed case definitions, surveillance processes and laboratory testing protocols. The director of Health Canada's division of immunization and respiratory diseases says the guidelines are more rigorous than those proposed by the World Health Organization (WHO). “We took these above and beyond what was requested,” says Dr. Arlene King. “In addition to looking for clusters as proposed by the WHO, we will also be looking for individual cases” (see box). · Test for SARS-CoV only after appropriate consultation.